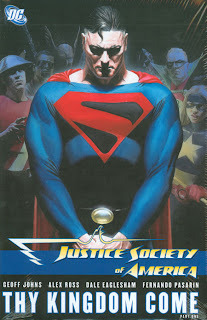 The only bad thing about Justice Society of America: Thy Kingdom Come Volume One is how long we have to wait, as they say, for the next exciting episode. Geoff Johns brings his usual level of excellence to Justice Society, making even the tiredest comic book cliches new again in a blast of costume-wearing superhero greatness, and if part one is this good, I can't imagine how rock solid part two will be. The "Thy Kingdom Come" storyline that begins in the third chapter of this book stands as a sequel of sorts to the Johns-penned Infinite Crisis. Power Girl recalls the death of the Golden Age Superman Kal-L in that tale, tying his dying words to her new chairmanship of the Justice Society, just as a new Superman who strongly resembles Kal-L makes the scene. Other books have referred to Infinite Crisis, but the way the characters recall both Kal-L and Superboy-Prime make this a natural follow to that story. Johns obviously tries to have his cake and eat it too here, having killed off the Golden Age Superman but still returning an "older" Superman to the Justice Society. I like the post-Infinite Crisis attempt to bring the DC Universe more in line with its history, putting a Superman into the Justice Society case in point, though I worry about the effects it has on the DC Universe overall. The whole point of chasing off the Golden Age Superman in the first place was so that new readers wouldn't wonder why there were all these Supermen running around; having an "older" Superman around, in my opinion, makes the younger Superman less special. What I like so much about Johns's Justice Society is how unabashedly the book embraces superhero culture. The first chapter brings us the origins of the new Citizen Steel, as the other heroes assume Steel will become a hero even before he himself knows. Johns similarly ends the book with the origins of a number of other heroes--a new Amazing Man, another of Black Lightning's daughters, the great-grandson of Franklin Roosevelt--their stories coming one right after another in simple, understandable form, all of them only too happy to play a part in the Justice Society. This is the legacy of Infinite Crisis shown also in Brave and the Bold -- the DCU is filled now with interesting, easily understandable heroes who like one another and work toward the common good. We've been so long in the grim and gritty, this is a breath of fresh air. There's a scene at the beginning of "Thy Kingdom Come" where the Justice Society serves pancakes at a fire station, straight out of Norman Rockwell, that by all rights shouldn't work. I'm hard-pressed to believe that the Avengers ever end up riding to fight a fire with a dalmation tagging along, but the Justice Society does -- and it's not nearly as corny-looking as it sounds. These are not simplistic heroes -- the moving second chapter has Damage taking the villain Zoom hostage -- but they're also not ones that Johns understands have to be "badass" to be cool; they're just cool on their own. It's all helped a lot by Dale Eaglesham's art, which I've always felt has a dark tinge even in the lighter scenes, giving this aged team a modern feel (and when's Eaglesham going to get to pencil a major DC crossover, I'd like to know!). The main villain of Thy Kingdom Come doesn't even make the scene in this volume, but the characters -- from the junior Red Tornado, Cyclone, to the new Amazing Man and Wildcat, Damage, and the Kingdom Come Superman -- are just so interesting that the story is gripping nonetheless. Justice Society, frankly, more than Countdown, seems to me the real spine of the DC Universe -- that is, the series that sets the tone -- or should, at least as far as I'm concerned -- for all the rest of DC Comics' titles. On now, at long last, to Superman: Last Son, and then a bunch of Superman stories from there.